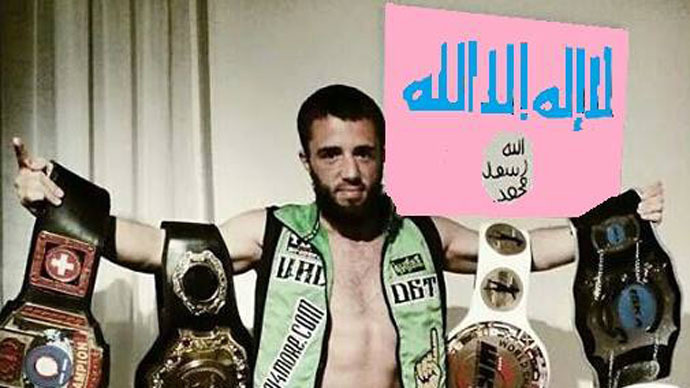 A 29-year-old German kickboxer and two-time Muay Thai world champion of Albanian origin, Valdet Gashi, has joined ISIS and left for Syria to fight for the Islamists, Swiss media reports. To all my Family and friends: I am ok.... will be back soon.... i am working on a new Project and i had no Internet all the time. more Infos soonso dont worry ;)Posted by Valdet Gashi on 4 Февраль 2015 г. There he had trained three young men at the ages from 16 to 20, all of whom along with the sister of the one of the trainees also joined ISIS and left for Syria. All three trainees attended the same mosque in Winterthur, 20 Minuten reported. One of the trainees, 20-year-old Hajan, also known as Ibn Muhamad al-Kurdi, has reportedly died in Syria fighting for ISIS. Gashi mourned the death of his “Kurdish friend’’ on his Facebook page and claimed they would soon meet again in “Jannah-al-firdaus,” the so-called Muslim seventh sky. My kurdish muslim brother....R.I.P. :(May Allah bring us together in jannah al-firdaus and accept from you. Amin#muslim #jannah #inshaallah #kurdiPosted by Valdet Gashi on 22 Март 2015 г. According to Atef Shanoun, the president of the Winterthur mosque association, that means Gashi is now seeking a martyr’s death through jihad. According to the SRF, Valdet Gashi has a wife and two small daughters, one of which was born just few months before he left for Syria.